Handcrafted elements and cozy proportions identify the Craftsman-style houses here at RounTrey. Craftsman-style homes have a similar style. But, the variation in colors and details is what gives each home their own unique identity. American Craftsman homes originated from the Arts & Crafts movement of the 1860’s. A reaction against the Industrial Revolution’s devaluation of the individual worker. Not to mention the over-decorated aesthetic of the Victorian design movement. The Arts & Crafts style movement arrived in the US in time for the decline of the Victorian era. Craftsman homes emphasized handwork over mass-production. Early Craftsman homes used costly materials and skilled labor, resulting in a wealthy clientele. Craftsmen took part in the design of these homes and add their own unique touches. The movement evolved to accommodate the growing middle class. The American Arts & Crafts movement shared the original British philosophy. This involved originality, simplicity, using local materials, and handcrafted details. The interior design of the first craftsman homes came from changes in the class system. Servants quarters in traditional Victorian homes no longer existed. The housewife of the era would be doing most of the housework herself. From this stemmed a need for the kitchen in the general living space. Breakfast nooks, simplified front porches, and lower ceilings all arose in the the Craftsman era. Some of the most renowned practitioners of the original American Craftsman style were based in southern California with some in the northern region. Frank Lloyd Wright, one of the most famous architects of houses in the U.S., played a big part in the development of American craftsman homes. 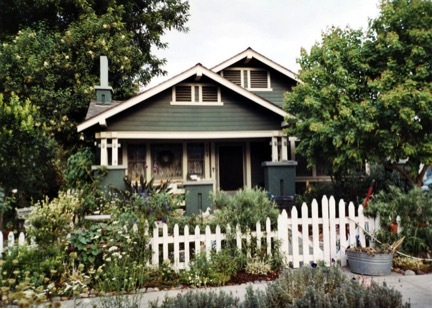 The Craftsman Bungalow became the most popular home in the U.S. from 1905 through the 1920s. Craftsman homes have survived and evolved through over a century of design movements and are appreciated for their personality.